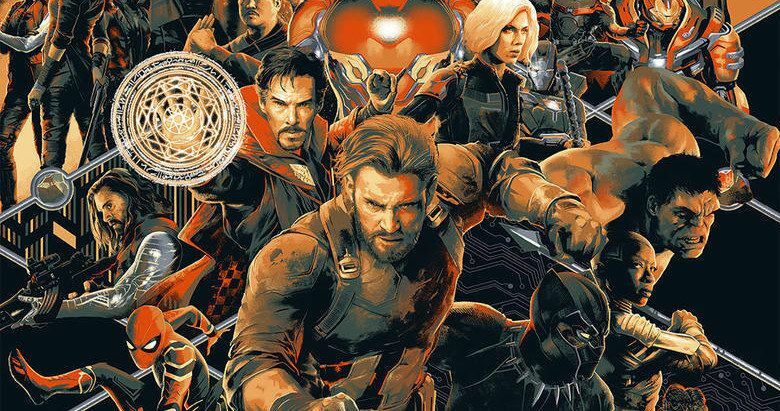 Marvel has revealed the new Mondo poster for Infinity War and it's undeniably epic. There are two versions of the poster. One is an exclusive variant that will be available at Mondo's booth during San Diego Comic-Con this weekend. The other version will be available on the company's website for a limited time as well starting this Sunday. In either case, it's a poster that Marvel fans would surely be very happy to have hanging on their wall. The new Infinity War poster from Mondo is jam-packed with the movie's heroes, with a bearded Steve Rogers out in front. Thanos ominously looms in the background, looking scary as ever. The poster was designed by artist Matt Taylor. Both posters are the same general design, but the coloring is different, a bit more stark, on the one that will be exclusively available at the convention. Both posters measure 24x36 and both of them go on Sale Sunday, July 22. For those who will actually be at the event, Mondo is located at booth 435 and the poster will be available at that location when the doors open on the exhibitor floor this Sunday. There were quite a few posters released for Avengers: Infinity War leading up to its release. Some of them were quite impressive, but this may take the cake. This isn't the only Marvel poster that Mondo will have to offer fans at SDCC, either. They also have a variant version of the MCU 10th Anniversary poster, also by Matt Taylor, which will be available at the Mondo booth on Thursday. Taylor is also scheduled to appear at the booth on Thursday for a signing, in honor of the poster's release. Marvel Studios is actually skipping out on a Hall H presentation for the MCU this year, which is unfortunate. But it's clear that they're still going to have a major presence at the convention, as evidenced, in part, by these posters. LEGO has also made a life-size Thanos statue that will be on display at the event. The Infinity War presence isn't terribly surprising. The movie went on to gross more than $2 billion at the global box office and San Diego Comic-Con is the largest pop culture event of the year. Naturally, the biggest comic book movie ever is going to be present, even if Marvel Studios isn't. In addition to the posters, Mondo will also be selling various Marvel enamel pins for $10 each at their booth. The Infinity War variant poster will sell for $80 at the Mondo booth, with a limited run of just 325 on hand, which means they're sure to sell out fast. The regular version of the poster is going for $60 and will be available via MondoTees.com starting this Sunday at 11:30 a.m. CT through Thursday, July 26 at noon. The MCU 10th Anniversary poster will set you back $65. You can check out all of the new Marvel Mondo posters for yourself below.